Investigate the relic seller at Belarata. Belarata — Uncover the secret of the Belarata ruins. A Khajiiti merchant calling himself Jurak-dar claims to have found a way inside Belarata, a long-sealed Ayleid ruin. In Vulkwasten, talk to Bataba east of Tall-Trunk Tavern and north of the Vulkwasten Wayshrine. She seems distracted and mentions that Belarata, a newly-opened Ayleid ruin, is very "scenic this time of year." She says if you hurry to Jathsogur, Jurak-dar might give you a tour. He sells artifacts from secret places, and you agree to look into it. There are three unhappy customers around his store. Talk to Gerwen, who says he sold her a Welkynd stone that dissolved in the rain. You can intimidate her (if you have the perk) or you can pay her 56 Gold to cover her purchase. Oltimbar says Jurak-dar sold him an old staff that fell apart quickly after he left Valenwood. You can persuade him that it was a mistake or pay him 56 Gold. 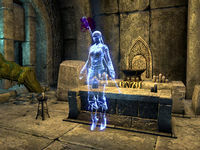 Manilbor is crouched over his brother Elebor and claims that a magic stone he bought caused a bolt of lightning to strike him. You ask him to show it to you, but when he retrieves it from the pack, he also gets struck by lightning. Talk to Jurak-dar. He is planning to leave and reveals that "she" gave him the rock. You can persuade him to tell you everything or ask who gave him the rock. If you get him to tell you everything, he reveals there is a ghost in Belarata who thinks he is her lover and gives him "mostly harmless" gifts belonging to her real lover. You can ask him what mostly harmless means, and tell him to show you the way in. Follow him as he runs to the brazier at the top of the stairs into the ruin. He sticks a sword into the fire, then kneels with it. The brazier glows with golden light. Jurak-dar stands up and enters the ruin. You follow him. Inside the ruin, he stops at the bottom of the stairs. When you talk to him he reveals why he is hesitating: "the ghost wants her lover to stay forever." He barely got out last time. 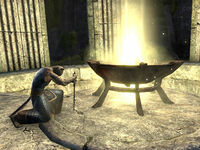 There is a barrier ahead, behind which are real Ayleid relics unlike anything he sold. To get through the barrier, you need to decipher writing around the ruin and on a sword. He wants you to enter separately. Agree and he gives you the sword and says he will distract her while you put together the poem. Alternatively, you can follow Jurak-dar into the barrier, which will cause Elanwe to attack you and allow you to skip straight to the reward. Collect the three Scraps of Parchment and read them in your quest inventory. Then head to the barrier and say the poem in order. You'll know you did it correctly when more light enters the room. Say "For many years I've lain beneath these stony walls, this weathered heath," then "Ten long years you were astray, with sword in hand so far away," and pick the only remaining option for the third—"So here I wait, I long to see if you'll at last, return to me." "Elanwe, at long last I return." "Varondil? You have been gone only a day. It feels like an age." "Each day is an age." "Yes, true, but you…where have you been?" "It is a long story, but come—Atherius awaits." "Yes! Together forever as it was always meant to be!" Talk to Jurak-dar. He is glad you put her to rest as she was very lonely for a long time. He gives you the reward he promised- an Ayleid treasure, the Blade of the Ayleid King, plus some other "spoils." Either complete the quest or leave the zone and come back and the voices will stop. This page was last modified on 11 February 2018, at 21:36.